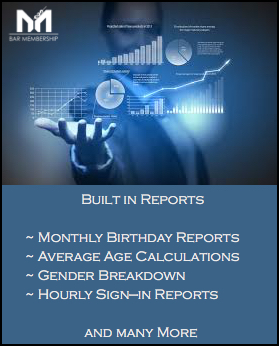 Bar & Private Club ALE Compliance & Marketing Software for North Carolina - NC. Port City Daily challenges BarMembership to a time trial to see how long it takes to sign up for a membership! If you’ve ever been to a bar in North Carolina than you're familiar with having to fill out a paper application and are issued a membership card that you have to bring back with you every time you return. 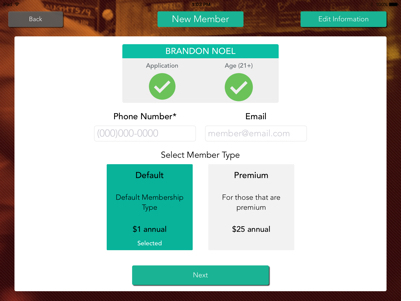 A Web and App based platform that automates the entire application process, keeping you in COMPLIANCE with the NC ABC membership regulations and providing you with very powerful MARKETING data. 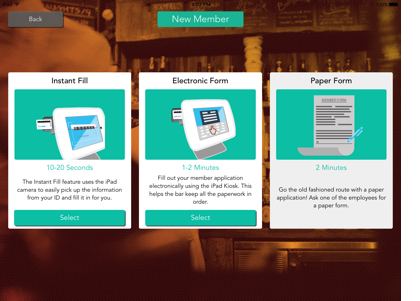 Your customers no longer need to fill out paper applications. They click on the "New Member" button on the iPad Check-in screen. 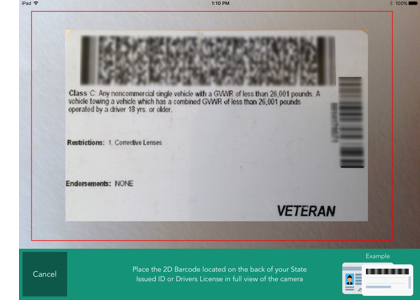 Applicants can chose the InstaFill feature where it uses the camera on the back of the iPad read a Drivers License or State ID barcode and fill out the application for them. This ensures you receive the most accurate data. With the InstaFill feature the application is complete within seconds! The more time prospective customers stand in line filling out paper applications is less time they're ordering drinks. The #1 reason bars end up serving underage is because the staff simply does the math wrong. 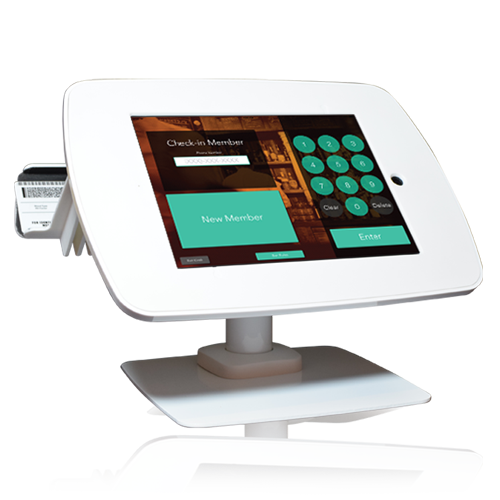 The BarMembership technology reads the DOB from the ID and auto caculates the customer's age down to the minute! The customers phone number is how they will chech-in for all following visits. This will speed them through the line and avoid having to track those sign-in books. In developing this state-of-the-art platform, we worked with ALE agents themselves. 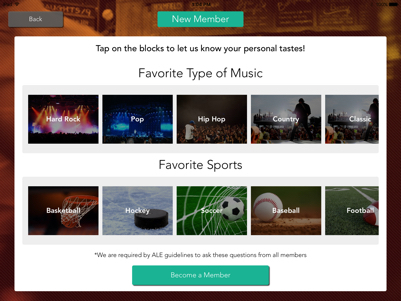 Each account comes with two basic questions about an applicant's music and sports preferences. Don't like these questions? We'll this is customizable too. Simply add in your own! In this final stage of the application process, each applicant is presented with the bars rules. 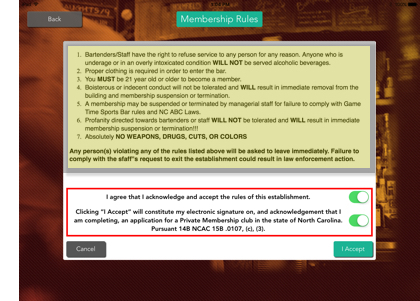 These bar rules are customizable and presented to each applicant and always available via the app. (7) Maintain and provide to each member a written policy concerning the use of facilities by guests. Use the North Carolina membership regulations to your business' advantage! and CUSTOMERS HAVE TO PROVIDE IT. North Carolina bars and nightclubs have at their disposal an incredible amount of marketing data that has been going unutilized. and frankly…a pain to have to deal with.